Many machines cause vibration. Usually this is undesirable. Through improved balancing, mounting on dampers, avoidance of resonant parts, and other measures, it's very often possible to reduce the vibration to an acceptable level. But when working on such a machine, it might be hard to guess, by sight and feel, how much the vibration really is, and whether or not it is improving through the work one is doing. An instrument to measure vibration is then necessary. This is called an accelerometer, because it measures the acceleration of the vibrating parts. This is typically more useful than measuring the amplitude of the vibration. I built a simple accelerometer, triggered by my sister's need to track down a machine in her neighborhood that robs her sleep by making the walls vibrate in the night; but I also intend to use this meter to keep track of the wear of my turbogenerator's ball bearings, among other uses. This is a very simple meter. It uses a monolithic three-axis acceleration sensor with on-chip signal conditioning, which I built into a little plastic case, along with a galvanometer and the necessary electronics in between. The whole battery-powered instrument is simply laid on the machine whose vibration is to be measured, or is held against the vibrating wall. It has only a single scale, covering accelerations of zero to one meter per second squared. The only control is the power switch. The frequency range over which it has full sensitivity spans 5 to 70 Hertz, which covers the frequencies at which most machines exhibit their strongest vibrations. Outside this range, sensitivity falls off at a rate of 6dB per octave, and above 150Hz it falls off much sharper. The value indicated on the scale is the RMS equivalent value of a sine wave vibration, present in the axis that is vibrating the strongest. That means, this instrument joins the three axes and always displays the highest value from among the three. This accelerometer could even be used to measure earthquakes, but a significant portion of a typical earthquake's spectrum falls below 5Hz, so the sensitivity will be a bit lower than it should. 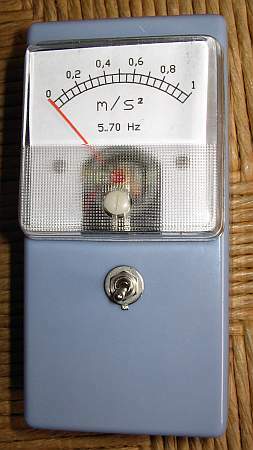 If you want to use this meter to measure earthquakes, you should expand its low frequency response by increasing C9, 10, and 11, at the cost of higher noise. That would also require slowing down the decay rate, by increasing C16. The noise level of the sensor I used is about 0.05 m/s^2. Any vibration to be measured must be clearly stronger than this, or it will be buried in the meter's noise, and thus undetectable. 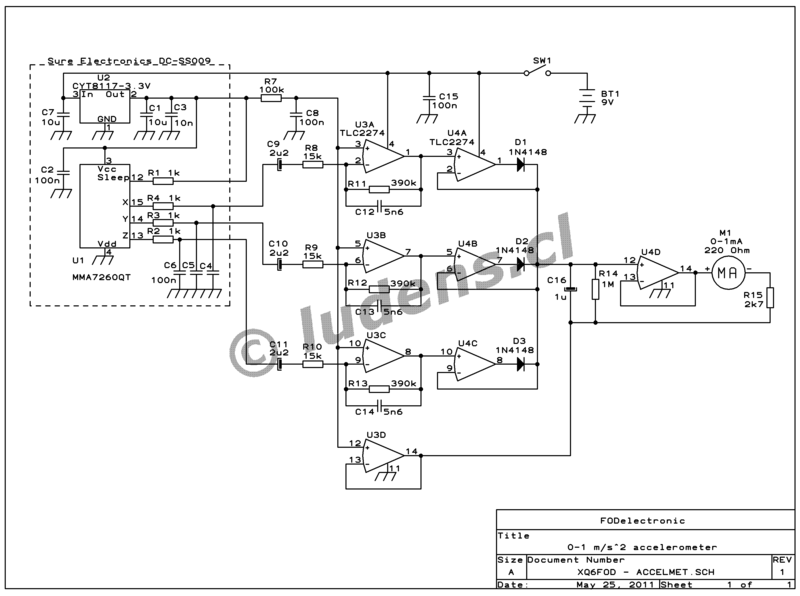 You can click on this schematic to get a higher resolution version, for printing. The sensor chip is an MMA7260QT. Since this IC is a surface mount device that has connection pads under the body, it's hard to solder with hand tools. When I bought it, I still had no reflow soldering equipment, so instead of buying the chip alone, I bought a little module offered by Sure Electronics on eBay, that has the chip mounted on a little circuit board, along with a 3.3V regulator and bypass and filtering components. This module can be easily integrated into the rest of the circuit, which I built on universal prototyping board. The circuit is pretty simple: Each of the three outputs of the sensor is amplified by independent frequency-shaping amplifiers, and then the three signals are joined in superdiode circuits that react to the highest peaks present in any of the three channels. There is a one second time constant filter, and then a 0-1mA galvanometer as display device, with the appropriate voltage followers in between. The op amps are directly powered from a 9V battery, and their bias voltage is simply taken from the regulated 3.3V present in the sensor module. There are no trimpots to calibrate the instrument. I don't have access to any well calibrated reference accelerometer, so there would be no point in playing with a trimpot and guessing where to set it. Instead the resistor values were calculated so that the meter will show a reasonably accurate RMS value of acceleration, assuming that the vibration has a sine shape, and that the sensor chip actually produces the output level stated in its data sheet. This seems to be true, to a level that is good enough. But if the galvanometer you get has a much different internal resistance than the one I got , which has 220 ohms, then you would have to change R15 accordingly, to maintain proper sensitivity. The gain of the circuit is set so that if the resistors and the sensor chip are all accurate, then exactly 2.814 volts across the combination of the meter and R15 should produce exact full scale deflection. So you can see that my 2.7k resistor should really be 2.594k, but I don't care for the tiny difference... and anyway I used 5% resistors, so the uncertainty is larger! 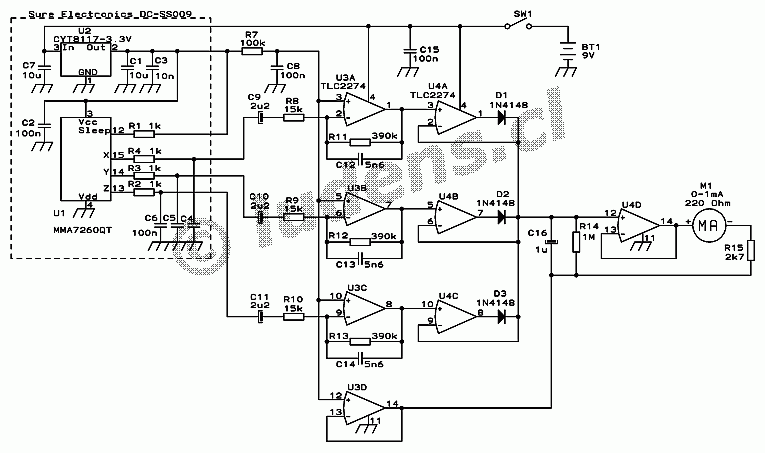 Maybe this circuit is useful to you just as it is, or maybe you will want to make additions or changes, depending on your needs. If you need to measure the vibration separately in the three axes, it's a simple matter to separate the channels in this circuit. You might also want to add more scales to expand the measurement range. Be aware that you cannot obtain greater sensitivity with this sensor, because its internal noise level is about 0.05 m/s^2. But you could perfectly well add scales for higher accelerations. The sensor chip can be configured to several spans, the most sensitive being 1.5 G (roughly 15 m/s^2), used, here, with the highest range topping out at 6 G. Also the amplifiers can be programmed for lower gain, by modifying the resistor values. Of course the values of the capacitors in the amplifier circuits would need to be modified accordingly, to maintain the desired frequency response. If you modify the circuit to measure high levels of vibration, of course you will need to place the sensor module in a unit that's separate from the box carrying the galvanometer! Otherwise the severe vibration will damage the meter... But for the low vibration levels I want to measure, it's fine to have everything in an integrated unit. I built the instrument using a ready-made plastic case. These are inexpensive, and very practical, because they come internally ribbed so that PCBs can be inserted in the grooves, without requiring further fastening. The 9V battery sits on the galvanometer, held in place by a piece of scrap board and some plastic foam, which keeps it from rattling around. 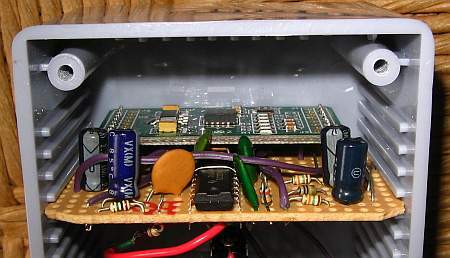 The wiring is very simple: Only the battery, power switch and meter are wired to the board. Everything else is on the board. The circuit was assembled on a piece of prototyping board that has a copper pattern just like the solderless protoboards. I find this pattern the most useful, and anyway these prototype PCBs are by far the most convenient way to build simple one-of-a-kind circuits. 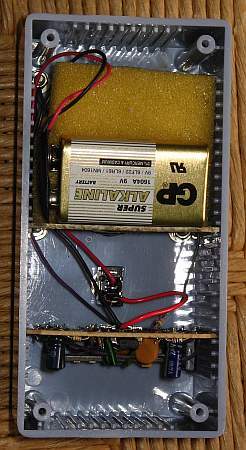 The Sure Electronics module is mounted just as if it were one more component. All of the small components (resistors, capacitors, diodes) for this meter were recycled from junked electronic equipment. Old video recorders, TVs, monitors, and other things, are a great free source of lots of components. If you still don't have a big junk box full of such electronic waste, it's high time that you go and visit your local TV repairman, and ask him for some! With modern consumer electronics being so cheap, a great many devices are never repaired, and accumulate at the repair shops. Usually the shop owners are happy to give them away for free, and recover the space they took up! I drew the meter scale in AutoCAD, printed it on plain paper with my inkjet printer, and stuck the new scale on top of the galvanometer's original scale, which is graduated in 0 to 1 milliamperes, using double faced adhesive tape. There are also some freeware programs out there that specialize in drawing meter scales, but being used to AutoCAD, I prefer using it for all sorts of mechanical drawings, including meter scales!